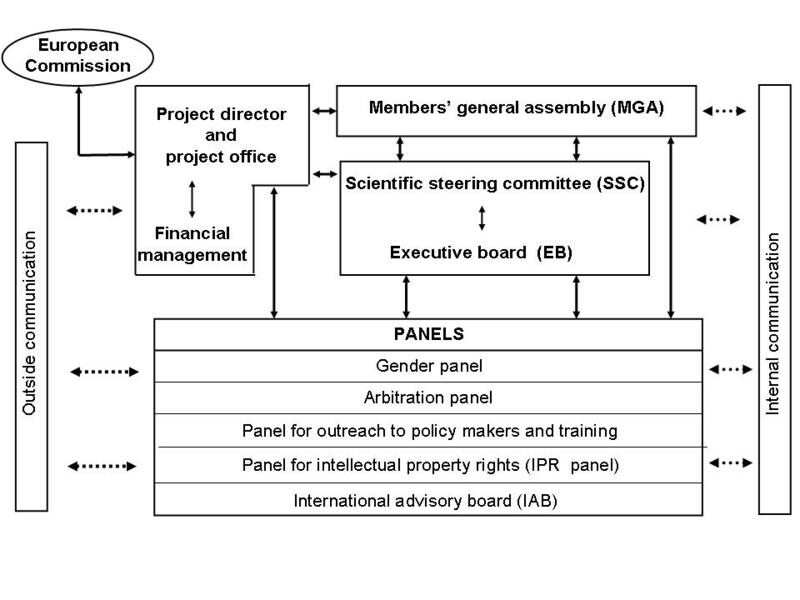 The MGA is the overall decisive body of the Consortium. At annual meetings, it gives scientific advice to the Steering Committee on the most important issues of the project. If needed, extraordinary meetings will be held. The MGA is responsible for all major formal decisions regarding project strategy, amendments to the Description of Work, amendments to the Consortium Agreement, decision and allocation of the budget in accordance with the contract, and any change to the Consortium. Decisions in the MGA need 75% of the votes present at the meeting. The MGA will acts upon proposal from the Executive Board. Members: Each partner institution has appointed one senior representative to attend the meetings, who is authorized to take decisions concerning the project on behalf of the institution. The Executive Board implements decisions on executive management, prepares decisions to be approved by the MGA, and ensures that adequate management is in place to monitor the science and perform quality control of deliverables. The EB will also decide on smaller issues which occur on a day-to-day basis and which do not warrant the involvement of a larger group for practical reasons. The SSC advises on the overall scientific policy, direction and management of the project to be decided by the MGA. The Project Office is organized at UIB. It is responsible for the day-to-day management of the project and acts upon decisions taken by the EB, the SSC and the MGA. The Gender Panel is responsible for CARBOCHANGE’s gender action plan and gives advice to the SSC and EB on its implementation. The members will make recommendations on relevant gender issues related to recruitment of CARBOCHANGE staff and monitor how special needs for female researchers are being taken into account in the various training and research activities. The Arbitration Panel resolves conflicts occurring between partners of the consortium in relation to the project. It may for example become active in conflicts on authorship on publications resulting from the research in CARBOCHANGE. The Arbitration Panel will review the conflicts together with the involved partners and propose solutions. This process is detailed in the consortium agreement. The Outreach Panel gives advice to the EB and the Project Office on dissemination activities and outreach procedures of the project. It will channel the synthesized project results as obtained in WP8 to make them available for international assessments such at the 5th IPCC Assessment Report. The management of training will mostly focus on the training of Master- and Ph.D. students which will become involved in the CARBOCHANGE project. The IPR Panel is responsible for clarifying intellectual property right issues in case of conflicts (such as coauthorship or distribution and release of data by and to the consortium). The IPR panel will also give advice to the EB about all aspects of intellectual property rights. 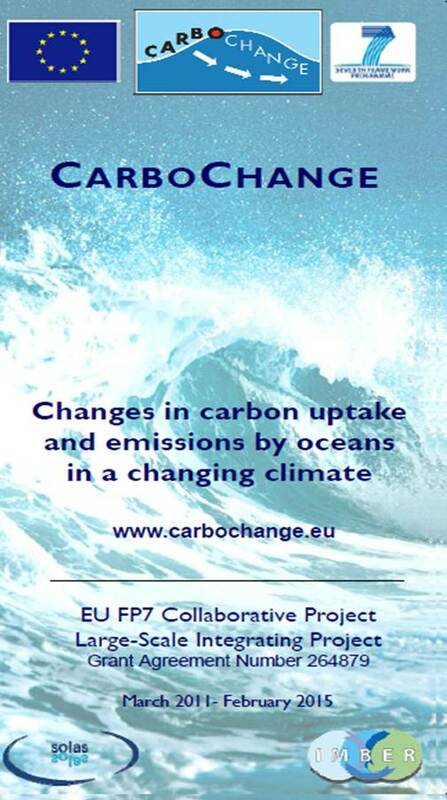 The handling of all data created under CARBOCHANGE will be regulated by a binding data policy to be established also in consultation with the FP7 coordination action COCOS. The management of Intellectual Property Rights (IPR) among partners will be regulated by the Consortium Agreement to be developed by the coordinating institution and signed before the start of any eventual project contract with the Commission. The CARBOCHANGE International Scientific Advisory Board is composed of international distinguished scientists to ensure external evaluation of the project and link to other programmes and activities inside and outside Europe.